Where are UFO’s from? In the days of my wild, impetuous youth, I once asked a ouija board that very question. The answer came in three letters… GOD! Yeah… I know, bad idea…never played with them since. However, the answer does make some sense when you think about it. Astronomers now say there are trillions of Earth type planets in the observable universe. Billions of galaxies containing billions of stars mean countless planets to nurture life. The heavens are made of the same stuff…. it was all created in the same Big Bang. So it becomes more logical for other Earths to exist. Scientists say there are more stars in the cosmos than grains of sand on every beach on earth! Now that’s a stat. to get your head around. The idea that secret government agencies are responsible for all UFO reports is, in my opinion, flawed. For starters, sightings go back 1000’s of years. 70 years ago the ‘modern’ wave of sightings began during WW2 (remember the Foo Fighters?) and increased dramatically after pilot Kenneth Arnold saw 9 discs ‘skipping’ through the air over Mt Rainier, near Washington. Aviation back in the 1940's was quite primitive. The English even built aircraft like the de Havilland Mosquito from wood! Was there anti gravity technology way before the computer age…? I really don’t believe there was. Also, it is very difficult to completely dismiss every one of the many 1000’s of reports of alien beings in CE-3 type encounters. This is just another pointer to aliens and their spacecraft visiting earth. Mind you, it is a little different today. Retrieval and reverse engineering of alien craft has meant some UFO’s in the sky are ours. Particularly the anti gravity black triangles called TR3B. My nephew’s wife had a good sighting of one early this year in the Pocono mountains, just a couple of hours out of New York. She said the triangle shaped aircraft was moving slowly and had a large red light in each corner. If anyone is not inclined to believe in alien visitors, I suggest watching the Disclosure Project. Highly ranked ex military and intelligence operatives reveal to the National Press Club of America what they know about the alien connection. They are all prepared to testify on oath to Congress about what they have experienced. Interesting to say the least …and impossible to totally disregard. Unless of you are a complete and utter skeptic with tunnel vision. Ronald Reagan is said to have mentioned an “alien threat” at least 5 times in his speeches. Addressing the United Nations, he famously asked “I ask you…is not an alien force already among us?”. Perhaps the President knew something he could not elaborate on. Re: Where are UFO's from? Searcher, I can tell you that the Ouija board is not an instrument of God so if that was the answer you received it was coming directly from his adversary Satan because that's who controls the Ouija board and he is not known as the Great Deceiver for no reason. My cousins found an Ouija Board many years ago and thought they would have a bit of fun. The glass was moving around the board to spell out the answers as questions were asked. My aunty now a Christian became concerned and asked from whom these answers were coming from the glass spelt out S-A-T-A-N. She destroyed the board and burnt it. The answer you got makes no sense because God does not answer questions through Ouija Boards. Sorry if I've turned your post into a religious viewpoint but once you mentioned Ouija Boards that was the trigger. G'day senses. Thought that might be a trigger! As said before, I was young and naive at the time. In light of what I know now, never again! I will take your comments on board. The only reason the answer made sense to me at the time was to make me consider if there is a God, then He would be God of the entire universe and all things that dwell within it. And that would include alien beings in UFOs. Where are UFO's from? IMO.... another dimension much like the Spirits conjured up on the Ouija Board. The fact that two Ouija board experiments (part of the occult) performed by two different people got two different results one a response of ["GOD" and "Satan"], suggests there is something in religion to take note of and not dismissed as old fairy tales. IMO we did not evolve from some kind of Fish or bacteria, nor were we created by Alien beings, a lie which will come, but we were created in an image by the most high Elohim. Searcher I am sure you have researched the abduction phenomenon and hybrid beings into UFO's? IMO we are not dealing with Alien Beings but the "Fallen" who have left their estate in another dimension and decided to deceive the world, either led astray or rebellious. Again the Hybrids walk among us, and are waiting to reveal themselves. Back in the 1960s my grandparents used to use Ouija Board some evenings when I visited them with my parents. My parents/grandparents were very religious but not occultist. I used to think it was all b/s and someone was moving the glass until one evening I was the only person with my finger on the glass and it actually moved. Any way it really spooked me and to this day I have never again used a Ouija Board and never will in the future. IMO UFOs are both terrestrial and extraterrestrial and there is stuff going on in our skies and has been for a long time. IMO Aliens are a fact. Some of alian look like us and they do walk among us. IMO the Aliens and ourselves all have the same creator whoever or whatever that may be. Interesting Dion touches on the inter-dimensional aspect. More on that here. And yes, I have read a lot about abduction. Even spoke at length with a person a month ago who had a UFO experience with missing time. It started at night on a lonely Victorian country road when he suddenly saw incredibly bright lights behind his car. He doesn't remember much else except that he was back in his car feeling very disorientated and lost in an area he knew very well. At this stage he does not want to undergo regression hypnosis. Pity, as I used to do hypnotism myself. Don't do it anymore as it is now illegal. And Black Stump, I'm yet to find the hour and a bit needed to watch George Green. Hope to do that soon. It is claimed the Earth has been visited by advanced interstellar civilizations that can travel through other dimensions faster than the speed of light. They use a set of physics entirely new to scientists and energy propulsion systems that were once only dreamed up by science fiction writers. The energy source seems to involve Quantum Entanglement which was something even the great Einstein struggled to understand. He referred to it as “spooky action at a distance”. Ben Rich was the second director of Lockheed Skunkwork’s from 1975-1991 He was known as the ‘Father of Stealth’and was the man in charge of developing the F-117A Nighthawk fighter. Before his death, Rich made several statements about the reality of UFOs and extraterrestrials. Dr Steven Greer from the Disclosure Project has also stated that craft fly here from the stars by travelling through other dimensions. The distance between stars is so incredibly vast! I always remember reading that if the Space Shuttle were to head for the nearest star,Alpha Centauri, at it’s maximum speed of almost 28,000 kph… it would take 168,000 years to get there!! So it becomes very obvious that if interstellar visitors are here (and they are) then they have clearly found a totally different method of travel than primitive rocket propulsion. The other factor is time. These aliens may be many thousands or even millions of years more advanced than us. 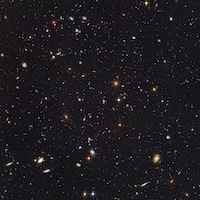 Think of it this way… the universe is said to be 13.8 billion years old. That’s 13,800 million years. As a thought experiment, imagine one million years is represented by an icy pole stick. Then line up 13,800 of them in a long line. Then think how totally insignificant one million years is in the overall timescale of the cosmos. How easy it would be for civilizations to come and go along that very long line. And remember our planet's aircraft technology dates back a mere 115 years to the Wright Brothers's first flight! It's fine to say stuff about how everything's connected, etc - but none of it actually convinces me of anything. That's just my opinion. I don't believe that aliens are visiting Earth. I've always believed UFO's to be man-made. I think it's the military testing prototype aircraft or propulsion systems, and sometimes things go wrong and people spot them at it. That's why they get so testy about the subject. It's also why these things are most often seen in remote areas, late at night. They choose remote areas to test this stuff, which makes perfect sense. It's also worth mentioning that human cultures such as the ancient Egyptians are believed to have used hot-air balloons to have surveyed the areas where they built their cities, pyramids, etc. The same claim has been made for ancient cultures in South America (Nazca, etc). The history of air-travel might not be so brief, and we Westerners often underestimate ancient cultures in surprising ways. Just because they had engineering skills we cannot fathom or emulate doesn't mean they had help from aliens - it just means they were a whole lot more sophisticated than we like to give them credit for. The idea that human civilisations prior to our own possessed some form of heavier-than-air flight seems more likely to me than the whole Erich von Däniken thing, which presupposes the ignorance of any culture which didn't originate in Europe. Erich von Däniken was like a modern-day Antiquarian, attempting to somehow 'explain' artefacts from cultures he knew next to nothing about. His ideas were based on other people's theories, and Carl Sagan was scathing about how "sloppy" von Däniken's thinking was. Erich von Däniken was a convicted fraud and a convicted thief long before he became a successful author (in which role the fraud he perpetrated was completely legal). I know it's tempting to look at stuff like the Avro Car or Stealth Bomber and think "they back engineered alien craft! ", but I don't buy it. The stuff von Däniken mentions - such as the Vimana which were the literal 'Chariots of the Gods' - needn't have been of 'alien' origin. Applying Occam's razor (yes, I know everyone hates me for doing it, but here I go again), it seems much more believable to me that human cultures in ages past figured out how to build aircraft than the 'alien vistors' hypothesis does. Now, if a more technologically sophisticated culture comes into contact with a less technologically sophisticated one we have evidence of what happens. You get something like a Cargo Cult. We know this has happened in the 20th Century. It's documented. We have some documentation which suggests other cultures have been capable of some form of air travel in the distant past - if less advanced cultures encountered them, these people would likely be seen as supernatural or 'Godlike' to the less sophisticated observers. The Vimana of the ancient Vedic Texts are 'floating fortresses'...could they have been airships? It's certainly less far-fetched than alien visitation, for my money. I'm more willing to believe that human beings in the past were much more inventive and sophisticated than we assume, than I am to think that aliens are visiting the Earth for some unknown reason. If these aliens are so incredibly advanced, how could any human government possibly control their actions or keep their presence a secret? It doesn't make sense to me. If they're coming here...what for? What would they want with us? I also find it unbelievable that they'd look anything like us; that only happens in Star Trek. The 'abductee' thing is another odd one - people who describe being abducted by aliens relate experiences very similar to the ones described by people in ancient cultures who were kidnapped by the faerie folk, or Gods, demons, gnomes, trolls, etc. People describe being taken to a strange place, where time works differently, and small odd-looking men scamper about doing all sorts of strange things to them, etc. If you read accounts by people who've been taken to some supernatural realm in the distant past, then read some accounts of alien abductees, you'll see the similarities pile up. It may be some form of response to trauma (the mind creates certain scenes based on archetypal images to mask a horrifying or psychologically painful event), or it might be an undiagnosed form of psychiatric illness, or a type of hallucination triggered by a range of factors we haven't yet identified. All of this is speculation...but it's less unlikely, by far, than the idea that aliens are kidnapping people and then performing medical experiments on them and putting them back in bed without anyone noticing, etc. All in all, it all sounds so unlikely as to be unbelievable to me. That's just my personal opinion. H.P. Lovecraft put the idea forward directly in his Cthulu stories beginning in the 1920's, Louis Pawles and Jacques Bergier wrote 'Dawn of the Magicians' (1960) which contained the idea of aliens visiting Earth in the distant past (and which is in the bibliography for Chariots of The Gods). There are other examples, Kurd Lasswitz, Charles Fort, Carl Sagan and I.S. Shklovski wrote about the idea in 1966 (Intelligent Life in the Universe)...the idea is an old one. If you wanted to, you could even include the Vedic Texts themselves as being examples of early 'ancient astronaut' stories. Simon… Let’s be clear. I am after a robust discussion here and not an argument. We are obviously in two different camps. My firm belief is that ETs are visiting Earth and you believe no alien being has ever set foot on this planet. I want to ask few simple questions. It involves the Disclosure Project evidence. And please don’t answer like a politician. Be succinct. The Disclosure Project has over 800 whistleblowers from high level defence contractors, government officials and military intelligence personnel who testify as to what they know about ET/UFO and the secrecy that surrounds it. There are 61 recorded testimonials by a wide variety of military and government witnesses with a direct knowledge of ET technology and beings. All are prepared to testify on oath to the US Congress. (a) Have you ever taken the time to watch, listen and digest all these interviews? (b) Do you firmly believe every single one of these expert witnesses is mistaken or just deluded? (c) How do you explain the giant 1 to 2 mile wide chevron shaped craft that flew slowly and with complete silence over Arizona in 1997? It was seen by up to 10,000 people including pilots, police and the State’s Governor. Please don’t tell me this humungous spaceship was secretly built here on Earth and ‘the powers that be’ suddenly decided to put it on show! The inescapable conclusion is if just ONE of these many interviews is genuine, then alien races are most definitely visiting us. It’s the sheer weight of numbers of the evidence that tells me ET visitors are real. Again I ask… if I am missing something here, please tell me what it is! If any further proof is required as to reality of alien craft and their occupants, have a read of this article that arrived recently in my inbox via Apple News. Okay, I'm just expressing an opinion not trying to belittle anyone else's. This will be my final post in this section of the forum. I'm aware of the disclosure thing you've linked to but, while I haven't read all of it, I've read enough of it to think it's untrue (again, just my opinion). I've also read lots of stuff about Project Serpo, and absolutely loads of stuff about aliens, ancient astronauts, etc, since I was about eleven years old. I've read every book Erich the BS artist has ever written. Jung, Hynek, all of it. The whole box-and-dice. I've read about this subject extensively over the course of many decades. I've always found the topic of UFO's extremely interesting but I've never found it convincing. The Military have been using this as a cover for their activities for decades - the 'alien' stuff is another layer of secrecy (in my opinion). It's a way of muddying the waters so people are loathe to speak up about anything they do see, and it gives them a way of spreading misinformation and general confusion. It's good cop/bad cop stuff, in my view. One agency says "It's all nonsense, nothing to see here" another bunch says "We'll testify that this is true", and the general public are left none the wiser (which is the whole purpose of the exercise). Like the Yowie stuff, people are seeing something they cannot explain, properly define, or place in context with their day-to-day lives. As to the precise nature of what they're seeing...it's a matter of opinion. No offence was meant, nor did I intend to start an argument. I was just stating an opinion, formed over many years of reading about this topic. Sorry to see you have decided to grab your bat and ball and leave this playing field. I was only trying to stimulate a spirited discussion on specific points regarding the reality of alien visitation. I mean no disrespect and understand you are entitled to your opinions whether they are of a believer or skeptic. No doubt our paths will cross in other sections of this amazing forum. To lighten the mood, here’s a link to one of my favourite hit songs from the 70’s… The Carpenters with “Calling Occupants of Interplanetary Craft”. Love the lyrics! Listen closely and enjoy. Ha thats awesome Searcher. Never seen that clip! The "I like it both ways" clip featured a u.f.o too i think for some reason. Band name escapes me at the moment...? Grat posts to by the way. Your knowledge of the u.f.o phenomenon is amazing! Thanks Greg! Yep top rockin song that! Banned originally i think? Yep thats right. Lol! Controversial but topical for those ..umm ' heady' times. I appreciate your kind words. Glad you liked the Karen Carpenter song "Calling Occupants". With that recording made around 40 years ago, imagine how much better it would have looked with todays CGI technology! Yep, I'm certainly very interested on the UFO phenomenon. My two good sightings keep me keen! One was around 2003 when I saw a black box hovering close to the Melbourne CBD from my inner city terrace. I raced inside to grab a camera and binoculars but they were upstairs and it took time. By the time I got back down, a cloud had moved across covering the position where the object was. Just bad luck. These days I would have just whipped out the iPhone and filmed away! The other was in early 2011 while visiting Dalby in Qld. I saw two orange discs in staggered formation moving swiftly across the sky in complete silence. I estimate both would have been the size of a dollar coin held at arms length. The sighting lasted about 5 seconds before (you guessed it) they moved into a cloud bank. I had one witness standing with me who also saw them. They moved at a speed comparable to a jet fighter. Yowie bait... 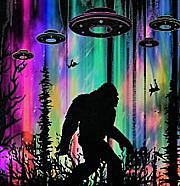 I would definitely swap one of my UFO sightings for a Yowie encounter like you had. Although perhaps an experience not quite as severe as yours was! Another well known song from the 70's with a cosmic theme is David Bowie's 'Starman'. Guess I like the nostalgia. I've never had the pleasure of a UFO sighting and I'm sure like Yowie sightings would be something that would provoke all kinds of emotional reactions. Too think that the universe ( plurals ) are essentially infinite, it would not be hard to come to the 99% probable statistic that life exists elsewhere. Thats my belief and not everyones I'm sure. The Disclosure Project really has bought the whole question up into the mainstream. Its littered with controversial facts about why we need to take this seriously but there will always be one major stumbling point in my opinion. I don't think the human race is ready to accept it. Chris V, your last statement says it, IMHO, and not just with regard to the presence of UFOs, but of the Hairy Folk, too. Religious influence is undeniably one of the mainframes of our society, no matter where you come from in this wide world. The dominant religious beliefs of each country have dictated how laws have been enacted and how legal processes are established, and whether such things as death penalties and capital punishment exist, for example. Even though many people do not subscribe to one universal religion (which doesn't exist), neither do they agree that other religions are 'right'. Some don't follow any religion at all, others just don't know what to think. However, given that religion and power/politics are inextricably entwined in Australia and elsewhere, it would be impossible to deny that Australian White Society/Religion is based predominantly on The Bible, because that was the dominant belief system of the pioneers and convicts who were brought here to populate Australia. As such, admitting that there are beings that are not 'made in God's image' out there, that is, not shaped like mankind as we know it and according to Bible Scripture, (and let's for a moment exclude The Flying Spaghetti Monster and The Old Gods of mythos and legend), may upset the clergy somewhat. If there is a God, then it is an effrontery to make assumptions about His intentions and creations, namely, that mankind and the beasts of our earth are all his doing and his ONLY designs. If the Universe is infinite, and God is omnipotent, then what was to stop him making some fantastical creatures suited to their own home planets, namely, aliens? And who is to say that mankind was the only design of it's kind - the Hairy Folk could have been the first experiment, and mankind came later. And if God DIDN'T create the aliens, the Hairy Folk or any number of other creatures and beings as yet undiscovered... then who did? Kind of messes up the 'God did everything' argument, doesn't it? Question one aspect of religion, then people start to question more of it, and as people stop blindly trusting in what they have been told, they explore, and learn more. This, is what most organised Western religion is so against, in my view. TRUST. BELIEVE. DON'T QUESTION THE ALMIGHTY, IT JUST IS. Ignorant and trusting people are easy to control, those who ask questions and buck the system, not quite so much. Wars have been fought and millions murdered in the name of religion, world wide, for millennia, to gain land, wealth and control of a population. Some Religions I can name are nothing more than a way of controlling the population by fear, reprisal, punishment, peer pressure, monetary restriction and so on, by promising 'good people will go to heaven' and 'bad people will go to hell'. The Religious Leaders enforce and enlist new members to the flock, to keep it growing, and expanding in power and influence. Some of them are no better than Cults, and there are reasons they strive to keep their practices secret and hidden from 'unclean outsiders who wouldn't understand'. I guess the religious mob don't like the idea of aliens coming down to Earth with far superior weaponry, and perhaps wiping out or enslaving the human race, because we might be seen as nothing more than troublesome interstellar cockroaches that are hell-bent on out-eating, out-consuming and downright destroying our home for the selfish goal of becoming stupidly wealthy and controlling. Did God get it wrong with humankind? Is he aiming to correct his mistake once he sees how vile we have become as a species? Personally, I would say wiping out humankind before it destroys our planet is probably the only way that Earth will survive until such time millions of years down the track, it's sucked into the Sun and rendered non-existent. I don't care if you choose a Religion to follow, and I have no gripe with anyone who is dedicated to this way of life, or anyone who chooses not to align themselves with ANY religious group. We have brains and the ability to make our own decisions. Just don't insist that your way of explaining something is the only way, because that is insanity. Bring on the UFOs and let's see where this takes us. Remember: What we know now about our world is fantastically different and advanced compared to what we knew in the 1600's or 1800's or even 1900's. Don't be so simplistic to assume we know everything now, and that no new learnings lie ahead. P.S. This is not aimed at anyone here specifically, it's just my opinion. That was a good read Shazz. 100% agree with everything you said. Not sure if the day will come when the grand revelation will happen - but you can be rest assured that if it does the world as we know it will never be the same. Hi Searcher! No worries there. I do enjoy your threads and posts on the U.F.O phenomenon. Its nice to see someone who's knowledge matches their enthusiasm! You are obviously well read on the subject and those two sightings sound like the real deal. The two flying together sounds very much like a lot of documented sightings. It would be hard not to take an interest in the subject after that if you weren't already. Shame you went for the binoculars and yeah the i phones are providing a lot of evidence for us to ponder! I dont know what to think of the origins but i do I like the interdimensional theory and the plain old " men from out of space" theory too. So many possibilities. I actually find it hard to imagine that they dont exist with so many sightings and reports over the years. Even my parents had seen a flying disc and in broad daylight on a crowded public beach in the 1940s or 50s along with hundreds of other people!! From the paintings of a U.F.O shootout from Germany, The FooFighters from world war two, the Flying 'Vimanas'(?) from Middle Eastern or Indian literature to the ancient cave paintings from all over including our own Wandjinas from Aboriginal lore etc etc and thats just a few and not even including Roswell or any modern encounters. Sure seems like theres something going on there! Of course not all had cool clips like the Carpenters! I really enjoyed that. Yes that is Bowie at his best. The world could use a few more aliens like Ziggy Stardust! As for the good old Yowies. Yep wouldn't it be nice to observe them safely from a distance without all the aggro and screaming. Prefereably with binoculars or a telescooe from a comfy deck chair! I bet it wouldn't take long before we asked ourselves.." what the hell are they doing?" Hey Greg. Used to watch them on Sunrise. Not a massive fan of the modern music but thats a nice little song that and yes very topical! I hadn’t seen this before, Ita Buttrose interviewing a women who saw a ufo at Frenches Forest in Sydney in 1980. Not a small object way up in the sky but a fair size just above ground level flying between two houses. Nice one Tuckeroo. Thats a real blast from the past. No one is telling this lady she didnt see an unidentified flying object! Interesting how she had to fill out the forms/ report for the authorities.. I thought I would post this video here instead of starting a new thread. It also relates to a previous link that I posted of a UFO sighting in Frenches Forest in 1980. This short vox-pop from the ABC in 1962 is asking whether there is life on other planets. At the start 0.20 a fellow is adamant about what he saw at Lane Cove in 1953.
any lights on a ufo could be a by product of its energy source. compared to an object with colours coming out of it. generally the northen beaches area and the central coast. Lane Cove is close by-the-crow to Frenches Forest, even 27 yrs later. Nice find, Tuckeroo. I really enjoyed watching those vintage vox pops. Television really was in its infancy back in '62... it was only 6 years old! I'd be fairly sure if those same questions were asked today, the results would be quite different. I think more people than ever before are starting to believe we are not alone in the universe. "The Carpenters with “Calling Occupants of Interplanetary Craft”. Love the lyrics! Listen closely and enjoy." OMG Searcher you have just brought back a flood of old, very pleasurable memories (Lets say it was a very nice encounter back then) when you listed that song! Back on topic, I too have read extensively on the UFO topic and consider myself an open minded skeptic (same for other phenomenon). I could not believe the famous Westall 1966 case in Melbourne was kept under raps for ages. Everyone knew about Roswell, but nothing about what happened in our own backyard. We need more healthy, robust debates about this topic.